Exclusive! Two-in-one style! 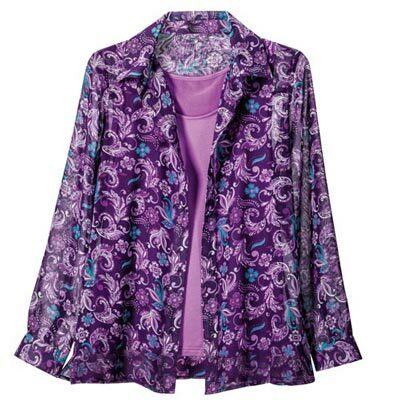 The long sleeve, button-down blouse features a vibrant paisley print, classic button-down front and vented cuffs. It is lovingly layered over a matching sleeveless tank. Pointed collar and a touch of spandex blended with polyester georgette offer fashion and the perfect fit. Ideal for daytime, evening and office wear, this is the ultimate go-to Pretty Paisley Shirt and Tank Set sure to add style and flair to your wardrobe. Machine wash. Imported. Misses, approx. 27"l.